Oshkosh has long been known as the Goose Capital of Nebraska, a reference to its fame for some of the best goose hunting in the nation. Crescent Lake National Wildlife Refuge 20 miles north, and Lake McConaughy to the east, make Oshkosh a prime location for sportsmen and nature buffs. 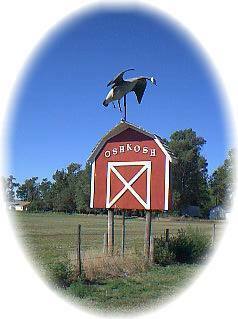 Oshkosh is the county seat of Garden County and is surrounded by the Nebraska Sandhills on the north, wheat farms to the south, and corn, bean, and alfalfa production in the North Platte River Valley. The first permanent settlers in this vicinity were men from the Oshkosh Land and Cattle Company, some of whom had come from Oshkosh, Wisconsin. In 1889 a two-story structure was built on Main Street for a general store, post office, and hotel. This building, still in good condition, now houses an antique and gift shop. The town is located on the North Platte River where the Mormon and Oregon trails can still be traced by well-worn ruts from the heavy wagon wheels. Oshkosh has two museums, a public library, an auditorium, center for senior citizens, and a city park with picnic tables and free swimming pool. The business district has stores and businesses that offer all the necessary items for a comfortable living, plus many specialty shops -- antiques and other collectables. As a provider of services for travelers, there are motels, service stations, and cafes. The friendly, small town atmosphere makes Oshkosh an ideal place to live, to visit or to retire.